It’s frustrating that a good cup of English-style tea is so hard to come by, even in fancy cafés. I hate paying a lot of money only to end up thinking that the best tea in Singapore is to be found at my home! Actually the root of the problem is very simple, and it doesn’t have to do with using expensive or loose leaf teas. It’s that the amount of tea leaves must be in the correct proportion to the amount of water. Anywhere that tries to get away with giving you one tiny teabag in a whole pot of water is cutting corners and giving you little better than dishwater :P.
Different brands produce teabags of different size too, so don’t be afraid to use two bags in a mug. For example, I used to think Lipton tea wasn’t very nice, until I realised that one Lipton bag is only good for a teacup of about 150ml, whereas most mugs are about 250ml. Marks and Spencer teabags are fuller and good for a mug, whereas the fancy organic London Tea Company teabags are Lipton-sized (and don’t taste all that great either, will continue to stick to M&S when I want organic). When brewing in a teapot for several people, use an appropriate amount of tea, even if that means one bag per person — don’t be a cheapskate! Now I can join the rest of my family when they eat baked beans & toast for breakfast with my own version :)! * organic, salt-free brown rice cake from Lundberg — a crumbly rice cake, not as smooth a texture as Kallo brand, but then again, this one is brown rice. Most rice cakes are soft and taste stale straight out of the packed, especially Lundberg, but nothing a couple of minutes in the oven toaster won’t fix. Be careful as rice cakes burn easily, so set the oven toaster timer for just 2 minutes but leave the rice cakes in for 5 minutes to crisp up slowly in low heat. * Pearl of the Orient tea from Gryphon brand — Singapore brand of gourmet teas in elegant packing. The extra-large fine mesh bags seem excessive but actually tea leaves need space to expand and release their full flavour. Gryphon’s Earl Grey is lovely (the brand’s best-selling tea in Singapore) but Pearl of the Orient, a jasmine+rose Chinese tea is definitely over-fragranced. Cheapest place to buy Gryphon teas is NTUC Finest at S$10.50 a box of 20 tea bags, $2 cheaper than chi-chi gourmet delis like Culina. Baked beans – homemade & failsafe! For ages, I have been watching my family members eating tinned baked beans for breakfast, unable to join in because of the tomato sauce which is high in glutamates, amines and salicylates (not to mention plenty of salt & sugar)!! 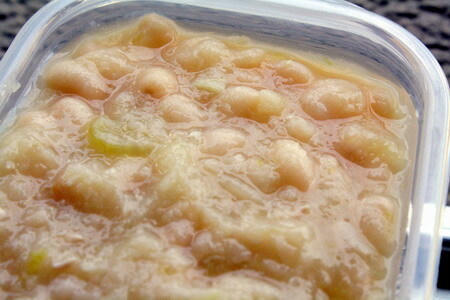 The other day, I finally got down to making Failsafe baked beans from the recipe in the Friendly Foods cookbook. The result was wonderfully satisfying! Even my family members who are used to the over-flavoured commercial version pronounced this ‘surprisingly edible’. Wash beans and soak overnight with 1.5 litres water. Drain the next day. Tie the parsley, garlic and celery into a bouquet garni with a piece of string and add this to the pot. Pour in enough water to cover the beans. Simmer uncovered for about 1 hour or until tender. Remove the bouquet garni. Add the sugar, citric acid, saffron and salt to taste. Simmer for another 10 minutes. Here I used dried organic navy beans which I bought at Nature’s Glory. If you don’t have time to soak the beans overnight, you can use canned beans. It can be hard to find navy/cannellini/flageolet beans, but I’ve seen them at Carrefour and Cold Storage, as well as at health food stores like Eat Organic and Nature’s Glory. Basically, check the stores which stock more western ingredients. With navy and cannnellini beans being more unusual products in Singapore, even the non-organic canned ones only come in relatively expensive foreign brands. The good news is that tinned, organic navy and cannnellini beans are available at about the same price as non-organic ones :), S$2.30 per tin for Eden brand. Other organic brands cost about a dollar more. Tip 1: Make a large batch, divide into serving portions and freeze. Defrost as necessary. 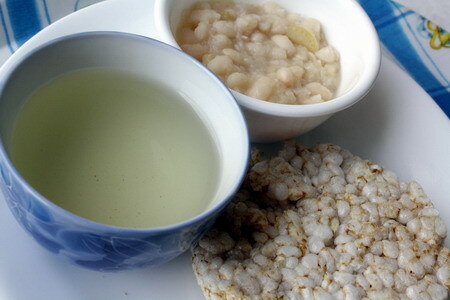 Tip 2: Aside from eating baked beans with bread (gluten-free bean bread for me) and rice cakes, it’s also good with rice. Especially quick and easy if you have cooked rice on hand at all times in the fridge or freezer. Recently, I enjoyed a midnight snack of Japanese rice and homemade baked beans, topped with strips of Japanese nori seaweed — delicious! I’ve been trying out dim sum recipes (steamed radish cake, water chestnut fritters and chewy pumpkin cake) from the cookbook by chef, Chan Chen Hei, without any idea who he is. But I’ve just discovered that he’s opened a new restaurant at the National Museum of Singapore (the same place with this food history exhibit that features traditional coconut graters among other things). Not that I’ll be able to try it out… I’ve stayed far, far away from any kind of Chinese restaurant after single-mouthful tasters left me feeling unwell for an entire week, on more than one occasion. Anyway, Chef Chan will be co-presenting a lecture at the museum on ‘Ancient Chinese Food’ with Huang Zhuolun 黃卓倫, the food writer from Lianhe Zaobao, on Sat, 20 Sep 08 from 4-5pm. Get the full details at the National Museum website‘s section on Lectures on Food & Culture. There are other sessions on tea (16 Aug) and chocolate (29 Aug) as well. If you’re into learning about food and cooking but relate more to organic, healthy and holistic instead, the hands-on classes on tofu & okara, fermented foods, raw food, vegetarian cooking, baking bread (no oven necessary), traditional Chinese snacks and spreads made from nuts, seeds & fruits, then the sessions at Wholesome Living look quite exciting. I’ve not been for any food classes before so if have any experiences to share, do leave a comment :). Of all the commercial non-dairy milks, my favourite is the Rice & Soy Beverage from Eden Foods. It’s got a rich, creamy texture and it’s subtle tastes are probably due to the inclusion of amazake, which is made from organic short grain brown rice and the fermentation starter, koji (Aspergillus Oryzae) as well as kombu seaweed. As amazake is fermented, those on a strict anti-candida diet should probably avoid this milk alternative. Read more about amazake and a detailed description of the product here. Blend till green tea dissolves and enjoy! I have some homemade red bean paste in the fridge, so perhaps tomorrow morning I’ll try a red bean version.